The Human Organ Tuning Forks are a set of 15 forks, one for each of the major organs and essential parts of the physical body. These forks are tuned to the frequencies of healthy human tissue. 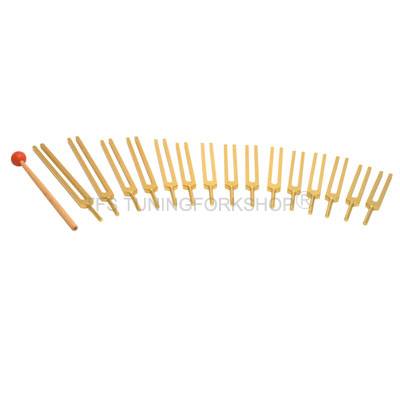 Free Rubber Mallet with this Tuning Fork Set. All Forks are in attractive Velvet Pouch. 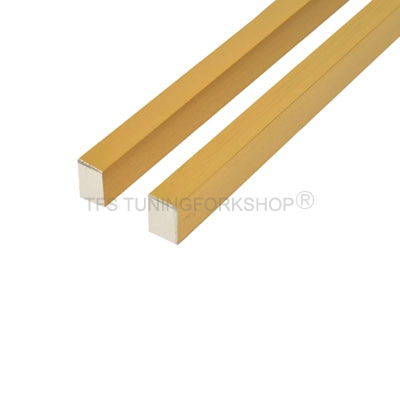 This Tuning Fork is made in Aluminium metal and anodized with GOLD coating. GOLD COLOR IS COATED ON TOP OF ALUMINIUM METAL WHICH MAKES IT EVEN MORE EFFECTIVE THAN OUR SILVER FINISH FORKS. Many healers have experienced this as the combination of color therapy with Sound Therapy is a very effective healing tool. The Gold color is all over the forks except on the tips as is shown clearly in the pics. The Human Organ Tuners are a set of 15 Tuning forks. They represent the 15 main parts or organs of the physical human body. An organ is a tissue that performs a specific function or group of functions. Usually there is a main tissue and sporadic tissues. The main tissue is the one that is unique for the specific organ.Theses tuning forks are tuned to the frequencies of healthy human tissue. . Barbara Hero & The International Lambdoma Research Institute discovered these. Sound waves were passed through healthy organs and the frequency was found using the speed of sound. TuningForkShop.com is not be responsible for typing or photographical mistake if any. Prices are subject to change without notice. © 2003-19 JOHNSON INTERNATIONAL. All Rights Reserved.